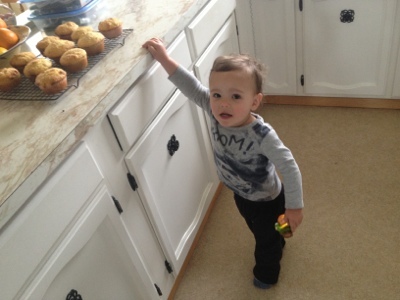 Dancing Mama: What to do with Leftover Holiday Treats?! What to do with Leftover Holiday Treats?! We still have some candy leftover from Easter, including a white chocolate solid Easter Bunny up until this morning! Since it may have otherwise gone to waste, I've been trying to come up with ways to transform them into new treats! 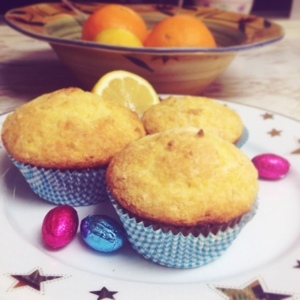 Today I chopped up that bunny and made some delicious Orange and White Chocolate Muffins! Here is the recipe to this delicious post Easter snack. 1 orange - zest and juice! 2. In a large bowl, whisk together flour, cornmeal, baking soda, baking powder, sugar and zest from the orange. 3. In a measuring cup, mix together oil, egg, milk, and the juice of the orange. 4. Pour the wet ingredients into the dry ingredients. Mix until it just comes together. 5. Stir in the chunks of white chocolate. 6. Line a muffin tin with paper liners. Divide the batter evenly into cups. 8. Bake in a preheated oven for 20 minutes. Cool on a rack. Enjoy with breakfast or as a snack! *Cupcakes with Lindor egg center. My 26-27 week pregnancy update! !